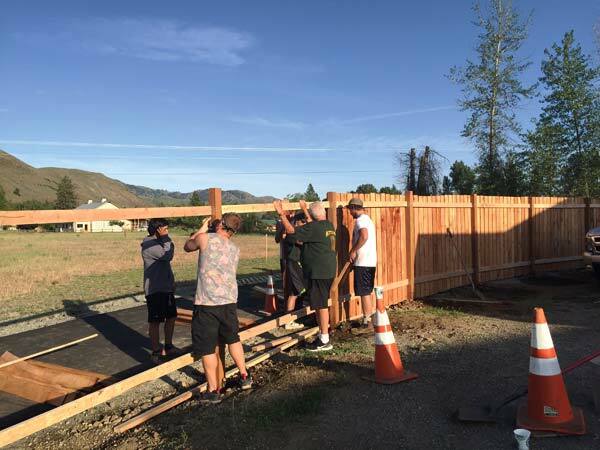 Liberty Bell’s football team worked on a new fence at Jamie’s Place. The Liberty Bell High School football team and Winthrop Kiwanis recently teamed up on a community project that produced a win for everyone involved. Suellen White, who is familiar with the project, said that the administration at Jamie’s Place, the adult care facility in Winthrop, asked Kiwanis to put up a fence between Jamie’s Place and the adjacent Susie Stephens recreational trail, to safeguard residents’ privacy. 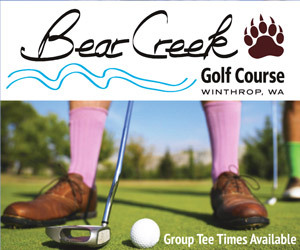 At about the same time, Tanner White, quarterback and captain of the Mountain Lions football squad, also approached Kiwanis for funding to support the team’s participation in a summer football camp this month. On May 29, about a dozen football players, a couple of coaches and Kiwanis members huddled behind Jamie’s Place after spring football practice. They arrived at 5 p.m., and by 7:30 p.m. the fence was completed. The Mountain Lions also staged a car wash last weekend to help raise funds for the summer football camp.